THE INTERNATIONAL BROTHERHOOD of Boilermakers is appealing to members across North America to contribute to relief funds in response to the devastating northern Alberta wildfire that has ravaged the city of Fort McMurray and much of the surrounding area. More than 80,000 people were forced to evacuate the community, and thousands of oil sands workers were forced to leave the area as refineries shut down as a precaution. The fire, which began May 3, was still burning in the Fort McMurray area as of June 8. It has destroyed more than 2,400 homes and other buildings and has resulted in a 25 percent decrease in Canadian crude output. International Vice President Joe Maloney said the Boilermaker construction lodges in Canada have collectively contributed $150,000 to the Canadian Red Cross, with $10,000 donated by the Boilermaker Contractors’ Association (BCA). The International in Canada has also given $10,000. 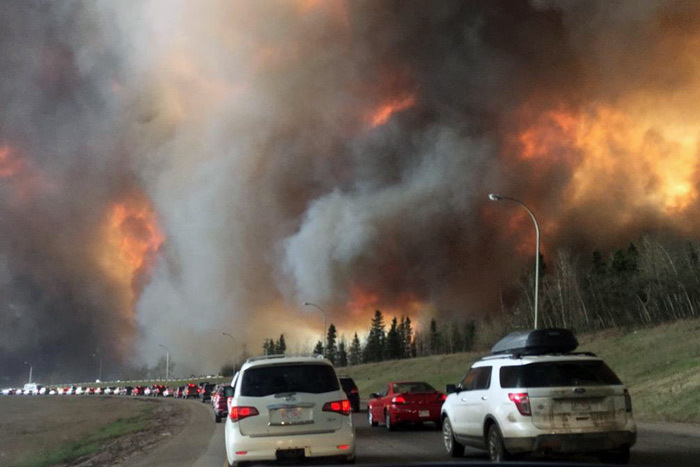 The Province of Alberta and the Canadian federal government each have pledged to match all amounts donated to the Red Cross in response to the wildfire, he said. International Secretary-Treasurer Bill Creeden has announced a general appeal to members for donations to the Boilermakers’ Disaster Relief Fund. Questions? Call International Headquarters at 913-371-2640. Local 146 BM-ST Dean Milton said that more than 40 L-146 members live in Fort McMurray and that the homes of at least two members have been confirmed destroyed. He said 1,500 to 2,000 Boilermakers, including travelers, were forced out of their shutdown work and new construction projects as a result of the fire.